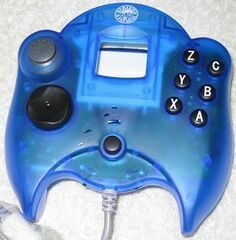 The Color Jolt Pad by Innovation is a third-party controller for the Sega Dreamcast. It is essentially an extension over Innovation's Color Controller range, with built-in rumble features. In Taiwan it has been spotted as Controller for DC With Vibration and in Japan it was released as the DC Dual Shock Controller (DC デュアルショック・コントローラー).